Are you looking for a trip that you can have plenty to do outdoors, touristy, has a lot of history and iconic monuments and you don’t mind the walking, I mean a ton of it? Then, Washington D.C. Is the perfect little getaway. Although hotels are quite expensive if staying within the city the District of Columbia has a lot to offer, among the best is the National Mall. You must not do D.C. without walking the National Mall. 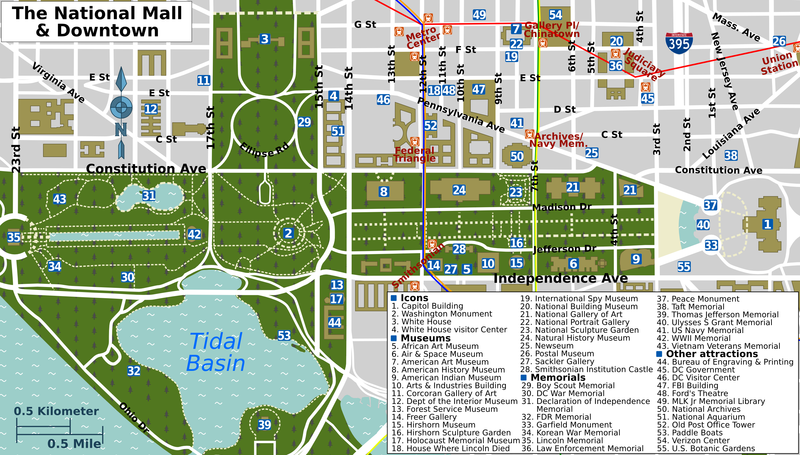 When you hear people speak of “National Mall” they are typically talking the distance and monuments between the steps of the Capitol Building, to the steps of the Lincoln Memorial, total distance= 2 miles. In between are many different museums, but most commonly visited are: Lincoln Memorial, Reflection Pool (in front of where Dr. Martin Luther King Jr. gave his speech, Washington Monument, WWII Memorial, National History Museum, Smithsonian Institution Castle, U.S. Botanic Gardens and the Air and Space Museum. If you are planning on taking the tour, this is the route I recommend: Start at the Lincoln Memorial (it’s an excellent spot to start the mood, feel the power of our history and be motivated and humbled for what it is we have today), Korean War Memorial, Martin Luther King Memorial, FDR Memorial, Thomas Jefferson Memorial (if you’re going for the Cherry Blossoms, this area is beautiful), U.S. Botanical Gardens, Capitol Building, National History Museum, African History Museum, Washington Monument, Reflection Pool and end where you started, Lincoln Memorial. The cleanest bathrooms, at the entrance of the FDR Memorial. If a House of Cards fan then your top stops would certainly be: Lincoln Memorial, FDR Memorial, Washington Monument and the Capitol Building. I suggest before doing the trip to spend an hour or so reading on the various Washington DC memorials, when they were built and their meaning. The research gives a lot more meaning that looking at people aged in stone, just saying. Additionally, it adds the story behind the words and quotes throughout the various memorials. Washington D.C. has made my top list of places I’ve traveled alone, for those adventurous solo travelers! Tips for D.C: (1) Bring your own water bottle and snacks; there are many fountains, but not necessarily vendors and food stops, (2) bring comfortable walking shoes; although they have Uber the fastest way to point A>B is to use those feet!, (3) although Washington DC is affordable with most of the museums and memorials free for roaming, plan ahead because hotels are not cheap, (4) if driving through PA to get to DC bring CASH for the tolls, about $40 for both ways– they don’t accept cards and (5) make it a point to revisit the Lincoln Memorial at night. ← Cherry Blossoms, or Not? I love this!!! How long was the drive there and back? This is definitely on my list for next year! The drive, from Ann Arbor to DC is 8 hours. I recommend making a pit stop over night in Pittsburg PA, if Friday is going to be a working day; it breaks up the drive and because Pittsburg is also beautiful! The National Mall, can be walked in a day– you won’t be able to do all the museums since they close around 5pm, but a lot of it is outdoor any how! Thanks for the comment– you’re already ahead of the game for the giveaway that will start this afternoon and have a winner Monday! Thanks! Based on your made-it-sound-simple blog post I’m going to schedule this trip ASAP! Maybe even next Mon or Tues! I just have to find the right hotel. Stay tuned! I hope you do make time to go! And, if you do please let me know what you liked/did! I would love to know, in case I too go back! Girl, rock it!